The husband of one of my good friends is due to have back surgery next week. I have been making some cards to send to him while he is recuperating. 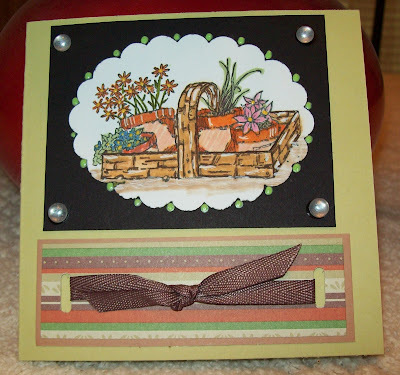 I really like the Long Time Friend set from Stampin' Up -- #1 because it is easily either masculine or feminine and #2 because it is so much fun to color!! While talking about coloring, I must tell you a funny story ... my doctor has given me a prescription for Ambien to help me sleep (neuropothy complications from my diabetes) and it seems to lessen the irritation felt from the neuropothy. 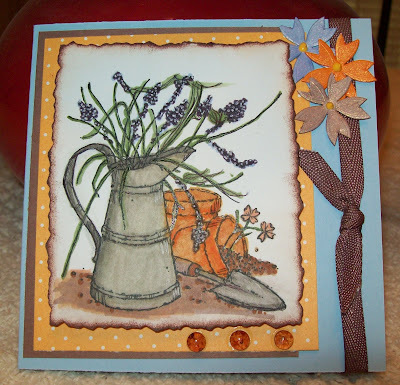 Well when Imade the first card (the watering can image), I had taken one 10mg pill almost immediately when I got home from work because I felt so bad. I went in the craft room and starting making the card (stamped the image, got my layout all set) and then started coloring. As the night progressed, I took another 10mg pill and went back to my coloring. I then got very tired and sleepy and decided to go to bed. The next afternoon after work, I went to finish up the card. To my astonishment, there were coloring marks on the image (the skinny leaves of the flowers coming out of the top of the watering can) where there was no image to be colored. The leaves go up either straight or at an angle and then down drooping from the can. Undoubtedly, the medication took hold of me and I just went "crazy" with a couple of coloring marks. Instead of doing the image all over again, I took a very fine black pen and drew in leaves where the green marks were. I hope that I was able to camoflage these mistakes. Back to the card I modified some flowers that I got at Michaels to mimick the tiny flowers coming out of the tipped over flower pot. I still like the way it turned out and will definitely send it on to Jay (besides that I think he'll enjoy the story that goes with it). The other card is from the same set. This time I didn't have to correct any coloring mistakes and will send it to him next week, too. Cardstock: Certainly Celery and Bashful Blue base from Stampin' Up; Close to Cocoa also Stampin' Up. White from Papertrey. Bitty Dots from Papertrey. Stripe paper from stash. that story is so funny! the one going across sort of looks like a snake! maybe that's what you were thinking about on the meds! are you sure you're supposed to take 2 of those? i say take one, and go straight to bed--no staying up!! HAHAHAHAHAHAHA!!!! At first I didn't see it and then I read!!! HAHAHAHAHA!!! I think you did the best you could to camo your drug induced embellishing. :D He DEFINITELY HAS TO HAVE IT!!!!! !